The first two weeks of the month were spent sunning myself in sunny Egypt but as soon as I was back I only had one thing on my mind and that was getting the rods out. During my holiday it gave me the chance to have a good think about my fishing and where and how I was going to approach it. 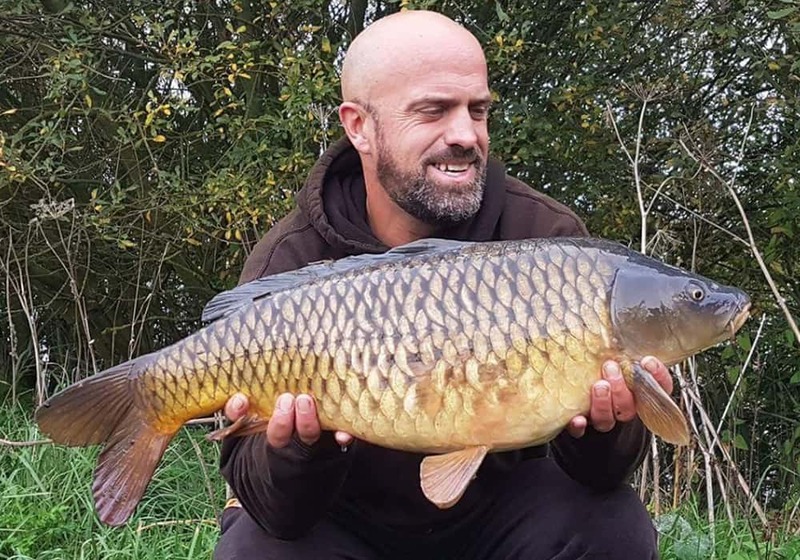 My fishing over the last year has been spread all over the place and I haven’t concentrated on just one water like I normally would, however this autumn and winter I planned to spend on my local club water. 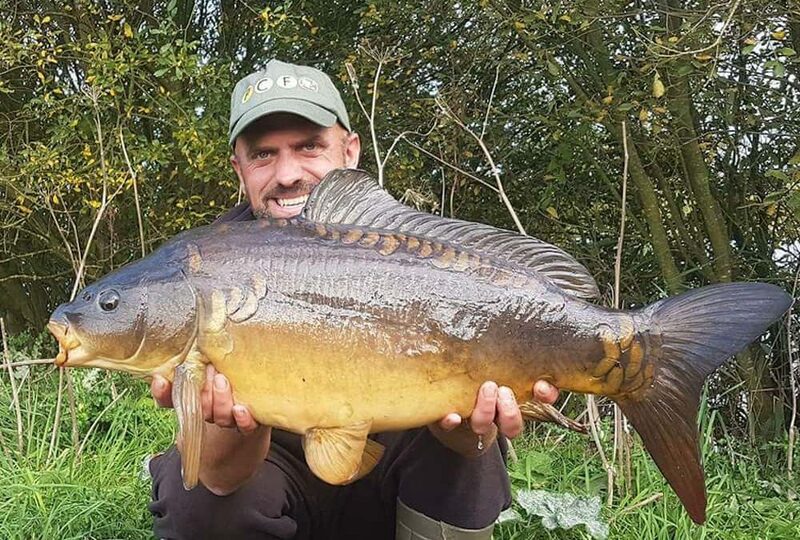 Now this is a water that is only 5 minutes from where I live in Bedfordshire and contains some stunning carp up to 50lb. The 50 that is in there obviously is my target but it is also everybody else’s who fishes it and at times it does get very busy down there. But in my head I knew what area of the lake I wanted to target and how I was going to go about it. I had everything in place in my mind, a well thought out and methodical plan. However… I walked round the lake on my return on the Saturday to find out it had been caught whilst I was on holiday at 50lb 6oz from the area I planned to target. My heart sank, all the plans I had shattered and I had to reset and come up with something else for the next few weeks. I thought to myself that I was still in with a chance of catching it but I’d give it a few weeks before I started my onslaught. Then out of the blue on the Monday after I received a text from a good friend on the lake saying that he had just landed it at 50lb 2oz!! To be honest I couldn’t have been happier for him but it made my mind up I had to fish somewhere else over the next few weeks. 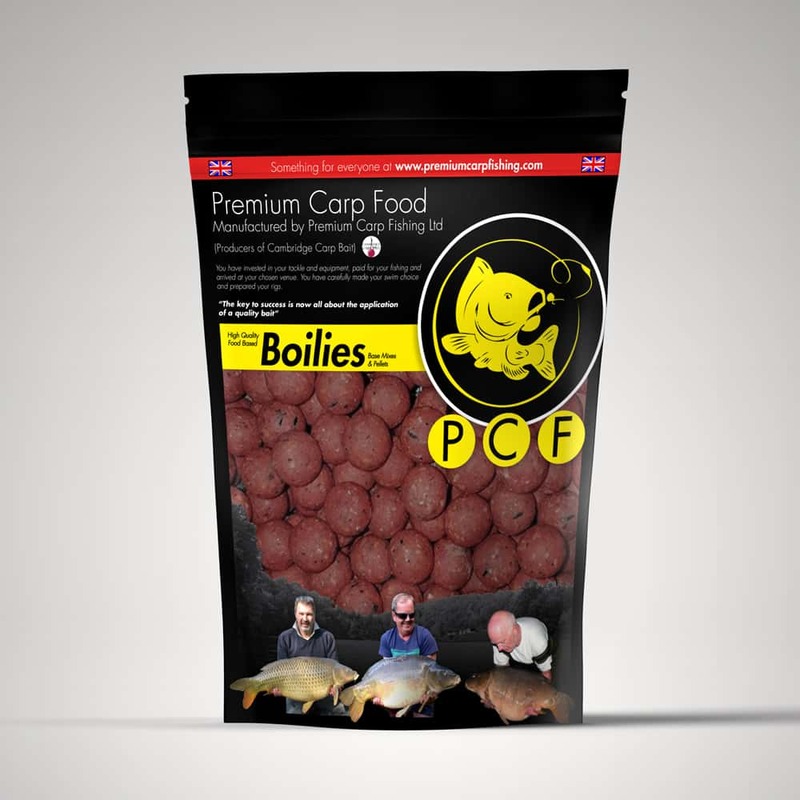 Teakettle fisheries came to mind. I hadn’t fished on here since the start of July and from what I had heard the big one in there hadn’t been out for a while. This fish goes over 40lb and is a stunning scaley fish. So the only weekend of September I had for fishing was going to be spent on there. Not only did I have to reset my plan of what Lake I was going to fish I needed to have a good sort out of the gear I took with me. I like to stay mobile when I go fishing so I can move onto fish if and when I have to, however over the last year I found myself taking more and more gear with me. I had to have a sort out, thin out the amount of gear I took and generally be a bit more organised. Going through my tackle bag I had 6 spombs, 2 spods and 3 marker floats as well as about 3lb in lead weights!! Do I really need all these with me? Probably not! Why did I have 8 different patterns of hooks when I only ever use 3, god only knows. Well with all my bits sorted fresh rigs tied and bait in soak I loaded up the truck for an early start after work on the Friday morning and got on the A1 pointing north. Its always a bit hit and miss when traveling on the A1 at this time of the morning, you can have a straight run through or you can hit traffic every step of the way. Thankfully on this occasion the roads were clear and I managed the journey to the lake in good time. On arrival I did my usual which was parking up and doing a lap of the lake. The lake was empty so I grabbed a bucket to secure a swim if I had found any fish. I had heard some info that peg 18 had produced during the week but I never let that sort of information effect my choice of swim when I get to a lake. At the end of the day the fish could have easily moved out of this area and into another part of the lake. It always amazes me the amount of people I meet on the bank who knew which swim they wanted to fish before they left home. I did a lap of the lake and saw a few fish in front of pegs 7/8 so this was the area I was going to fish. However, when I got to swim 18 a saw 6 or 7 shows in a short space of time, change of plan, I would be setting up in 18. It took what felt like ages to get sorted. Finding clear areas wasn’t an issue but everything else was. I couldn’t get my banksticks into the ground so had to change everything over onto my pod, my catapult elastic snapped on me twice, the wind blew my brolly out of my hands when I was putting it up and it started raining!! These things are here to test us but the fact I hadn’t slept for about 20 odd hours didn’t help things. All 3 rods were sorted, my left fished close in on the left hand margin over a scattering of 10mm Nut Job boilies, my middle on a clearer area at around 40 yards where I baited with whole and chopped Relish Boilies and my right a little bit further out. I baited quite heavily over my right hand rod with about 2kg of Relish boilies due to this area being quite a large clear area it gave me the opportunity to bait with boilies the way I like to fish them, sprayed everywhere. As for rigs I was using the Slip ‘D’ rig on all 3 rods fishing Snowmen with various coloured 10mm popups and a 15mm bottom bait. Using this rig gives me the opportunity to use my ever faithful stick mixes. 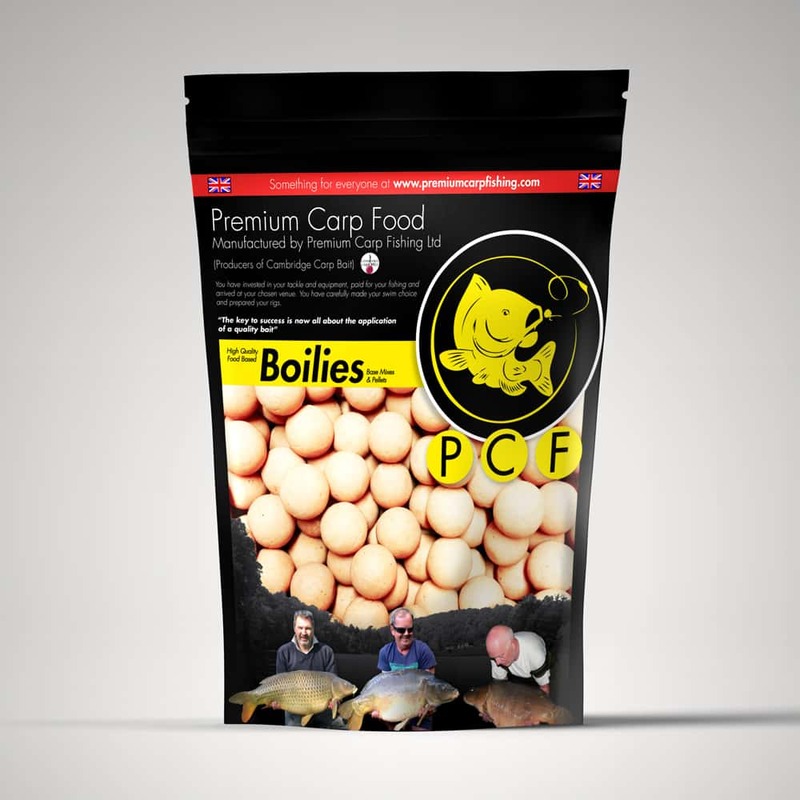 Gary Spencer the lake and ‘Premium Carp Fishing’ owner popped down for a cuppa and we sat talking all things PCF. 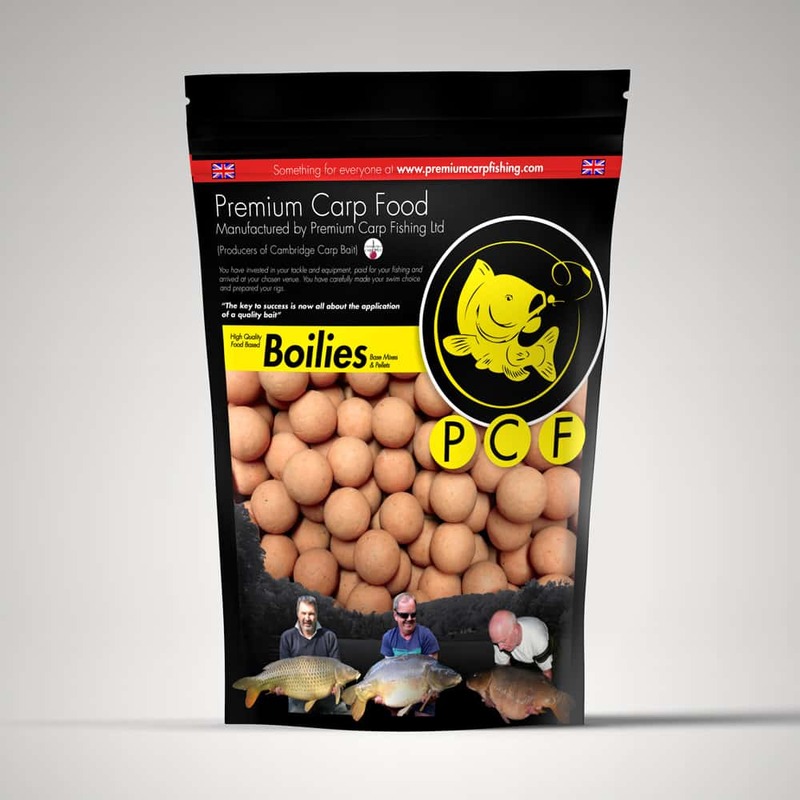 Next year is going to be a great year for the company with lots of exciting things happening especially for those who are part of Team PCF, more about that at a later date. After he left I got a few hours shut eye and woke to a liner on my left hand rod only to see a big swirl where a pike had struck at some small roach that were held up in the reed lined margin. The first night passed quietly with not so much as a bleep. I heard several fish in the channel to my right so I stood watching the water for a while and witnessed a few fish show themselves and from what I could work out they were heading into the area of the lake I was fishing. It was about 9:30 when I received my first bite which came to my right hand rod from the heavily baited area. The fish soon found the weed bed to the left of the area I hooked him from. Once the fish had weed over his head he just came in like a dog on a lead, straight to the net. It was when I lifted the net around him did he go mental, like a bloody grass carp. I let him calm down in the margin for a while before I did the photos. The fish was a lovely common of around 10-12lb, with a couple of photos done and the hook hold treated I slipped him back. Whilst I was sorting a new rig and bait, my middle rod burst into life but after a short battle the hook pulled! I hate losing them! I got the rods back out for a few hours before reeling in and popping to see the lads who were fishing on Thorney Mere but not before spreading another couple of kilo over the spots. After a good chat with the lads I got back to my swim and got the rods back on the spots and I was fishing. It only took about 30 mins before my right hand rod was screaming off, they were obviously liking the Relish. After a short fight that lead me from one weed bed to another, a mid double mirror slid over the net chord. This fish behaved itself and after a few poses for the camera and the usual treatment where I had hooked him, he was put back to fight another day. The conditions were bang on for the evening and night, over cast a little bit of rain and a warm wind. The only issue was the air pressure was still high as it has been for a good few weeks now. The night passed uneventfully and I’m sure the fish had moved back into the other body of the lake. Whittle Mere has two large bodies of water and a channel that joins them and I’m 99% sure they moved from one to the other, the shallow area during the day then move into the deeper water at night. This theory was sort of proven right as at first light I saw fish showing in the channel again and then into the body of the lake I was fishing, and at around 9:30 my right hand rod was away again. This resulted in another lost fish. I never felt in direct contact with the fish as the line pinged off the weed beds. This happened to be the last of the action for me on this trip and also the month of September. September can be a very productive month it was just a shame I never had the time to do a bit more fishing. Until next time, Get out there, Enjoy yourself and remember… It’s only fishing!